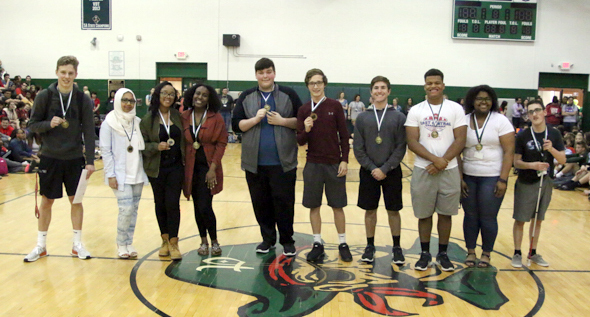 Twelve students at Pattonville High School were recognized with Pirate Code Student of Character awards for exhibiting character traits emphasized in the school's Pirate Code: Be Respectful, Be Responsible, Be Involved. Each year the Pirate Code/PBIS (Positive Behavior and Intervention Supports) leadership team at Pattonville High School invites staff to nominate students that exemplify these traits. The Pirate Code chairpersons and administrative liaison review the nominees and make the final selection of the school's Student of Character recipients for the year. During the school's spring pep assembly, students were recognized as Most Respectful, Most Responsible and Most Involved. Earning the designation of Most Respectful for exemplifying the character traits of respect, kindness, peace and self control were freshman Elizabeth Mulat, sophomore Anthony Costa, junior Nolan Prebianca and senior Marlon Chun Caz. Named Most Responsible for exemplifying the character traits of responsibility, courage, honesty and perseverance were freshman Anthony Ashby, sophomore Thomas McFarland, junior Isaiah Wilkes and senior Khalia Rucker. Recognized as Most Involved for exemplifying the character traits of service and cooperation were freshman Jailah Broadway, sophomore Afina Fayez, junior William Polster and senior David Ellison.